The Degenatron bartop from Haruman's Customs. The great thing about this bartop, is all you really need to put it together, is about 24 hours worth of waiting and some wood glue... I used GORILLA GLUE wood glue. No nailing, no screwdriver needed... clamps recommended IMHO. Very easy to put together, but there are some considerations to be had before you just "GO FOR IT". 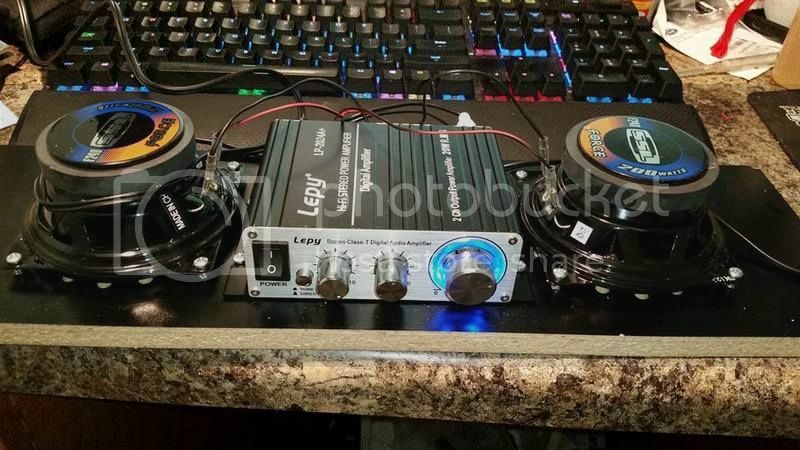 First of all, you'll probably want to pre-mount the speakers/amp before gluing everything together. Otherwise, that's a pretty tight space to try working with. I was able to mount 2 4" speakers and a LEPY AMP. It was a close fit, but very do-able. The position of the amp as shown here, gives me an optional volume control to play around with to set the arcade's sound to the desired level just by swinging my hand up around the back of the cabinet and adjusting. Also, note the bottom button ADMIN CP layout depth. If using something like HAPP buttons, you are probably going to have them banging into each other and will more than likely need to use spacers. PLAN AHEAD for this!! I used spacers as shown in this image, but even with the spacers, it was still a bit of a tight squeeze and needed to be manipulated a bit, but it worked..
My personal recommendation and what I will be doing when I build another one, is to buy one WITHOUT the 3 extra holes drilled at the bottom and just use the "SHIFT" function of an iPac 2 and just program your admin buttons into the regular buttons. This will enable you to put the CP on using HAPP type buttons and joystick without bumping into anything up front. I was also able to squeeze a 19.1" monitor in this cabinet with no problem at all. I used an ASUS VW199T-P. It is also noted that this kit it totally worth getting the extra T-molding and plexi glass bezel/marquee to go with it. I went a step further with the bezel plexi and tinted the glass using a 20% darkening tint (Wal-Mart®™). Using black duct tape around the monitor's bezel, then installing the tinted Plexiglas bezel gives this cabinet a sweet looking appearance and hides the monitor buttons, lights and branding. Overall, this was a super fun bartop to build and I look forward to doing more of them. I already have 3 other people who want me to build them one. I'd like to see maybe a little more depth to the admin CP so that installing Happ type buttons is not an issue, but for sure you could always go Sanwa or something like that as well. I'd also like to see a better system in place for attaching the control panel. The batons are nice for leveling it all out and for securing the bezel, but you can't really glue it together unless you want to strip the black melamine down to the wood to adhere. You could put hinges on as well, but again, those dang admin buttons kinda mess with you a bit. The monitor mount fit fantastic, holes lined right up although I did have to use a couple washers with the screws... yours will vary I suppose, depending on monitor brand used. I guess one thing I personally would have liked, is maybe an extended panel for the monitor that goes maybe an inch or 2 lower from the bottom. The reason being, is one could very easily use that space to mount the motherboard and hard drive onto. I almost went this route. I was able to get the ITX motherboard with standoffs positioned so that I could screw the standoffs onto the back plate of the monitor mount and the SSD drive right next to it. The only issue I had was the ram stick was just a bit too tall and protruded just a bit to much to get the back panel on. If I could have went down just a smidge more, it would have worked perfect. This would have left PLENTY of open space on the bottom to install a second console system... bummer... but oh well... I'm still very happy with this cabinet and would certainly recommend buying one if you wanna try your hand at building your very own bartop game. 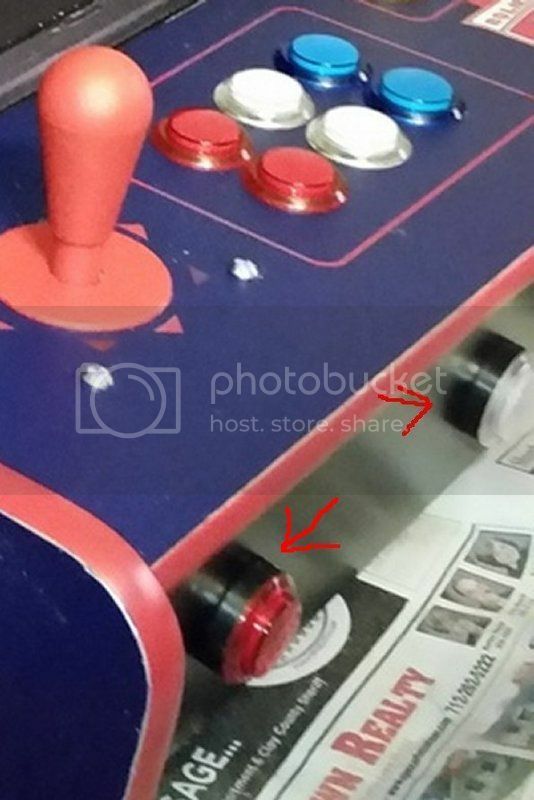 Re: The Degenatron bartop from Haruman's Customs. On the front buttons, I use Ultimarc GoldLeaf buttons. They fit the Happ hole, they look like Happs from the top, but under the CP is where they shine. Now if only I could find some just like that, with LED's (preferably RGB), the possibilities would be endless. I've searched high and low for low profile LED type buttons, preferably concave, and have had no luck. I'll keep these in mind though. I think PARADISE sells them as well. No, they don't. Those are Ultimarc exclusives. I think you're thinking of Sanwas. They are .110s. But I roll my own harnesses, so it doesn't matter. Good tips on the build -- especially the speaker/amp mount before glue -- I am DEFINITELY going to do that and probably owe you a beer before even starting! 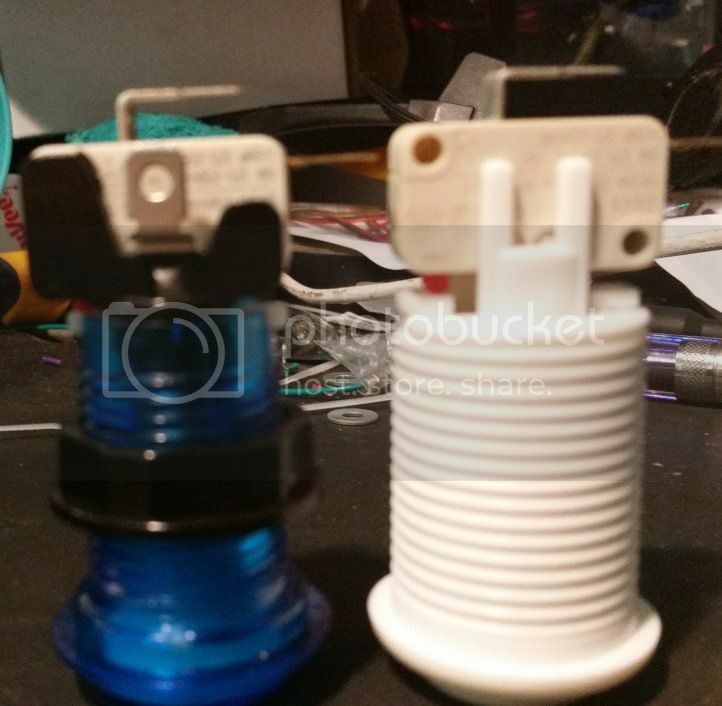 I just ordered a degenatron from haruman and plan on putting in a 19" Dell 1913S, Sanwa JLF sticks, and Seimitsu PS buttons that are not very deep at all. Should all be a good fit. Going to use my Mac Mini for now, but am planning on building a mini-itx Windows/MAME/Hyperspin PC in December. Really excited about this build, and looking forward to introducing my 7 year old son to some arcade classics. Phreakwars, can you tell us a little bit more about the acrylic it comes with? It's just for covering the monitor and the marquee, nothing for the CP correct? Did you make your own mounting hardware/brackets for the marquee? Just curious before I add $40 to ordering one of these kits. Just an FYI, if you email haruman, he can CNC you an acrylic cover for the CP. He included 1 in my order for a reasonable price. Yes, it's just the bezel and the marquee on the acrylic. The mounting brackets are basically just 2 plastic "L-channel" strips. I bought them from the website, but yeah, you could probably find the same thing at Home Depot/Lowe's. I purchased them from the website mainly because they were pre-cut. I'd imagine the hardware store would carry it cheaper if you don't mind doing a bit of cutting. Thanks guys. I made a replacement marquee acrylic for a cabinet I salvaged and turned out okay. I was pleasantly surprised how well a good blade on a table saw worked on it, provided you be gentle. Some sharp spade bits made quick and accurate holes for buttons too. 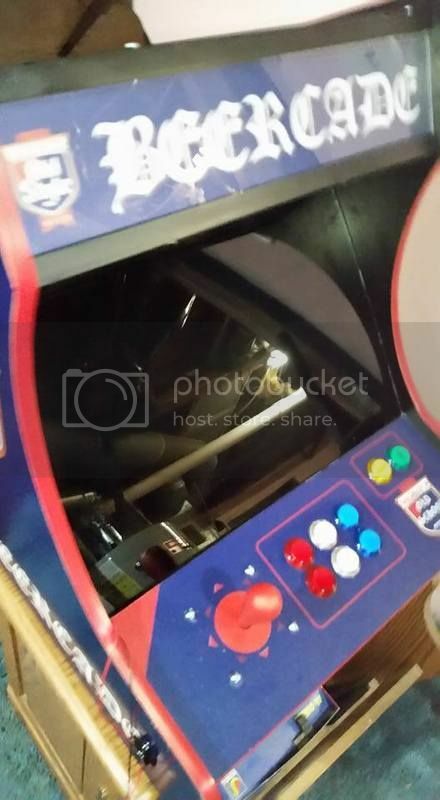 I was debating on ordering it, but my first bartop from Haruman is for a Pandora's Box (2 or 3, haven't decided) so I didn't want to put too much money into it. If it works out well enough that I get another bartop from him, I'll be sure to talk to him first regarding a full set of acrylic, including one for the CP. I've gotten pretty good with a roundover router bit, but I never have as much time as I'd like to play with this stuff. After my order (earlier this afternoon), he replied to a question regarding the admin panel buttons interfering with the CP and agreed to leave it solid. I'll find some different buttons to use on the front and 1-1/8" holes would likely be too large.